The performance of hot mixed asphalt concrete (HMAC) mixtures is measured in terms of its resistance to rutting, fatigue, low temperature cracking, and raveling. The resistance of HMAC to these failures can be evaluated through the measurement of its moisture sensitivity and its temperature susceptibility. The resistance of asphalt concrete to moisture-damage is very critical to its long term performance. Moisture damage manifests itself as a reduction in the overall strength of the mixture. Therefore, if a HMAC mixture is susceptible to moisture damage, it could eventually fail in any one of the three failure modes, i.e. rutting, fatigue, low temperature cracking, and raveling. The primary goal of an antistrip additive is to eliminate the moisture sensitivity of the HMAC mixture. 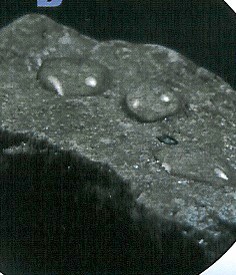 Eliminating the moisture sensitivity can be achieved through improving the bond between the binder and the aggregate. This binder-aggregate bond is a fundamental property of the HMAC mixture which cannot be evaluated through testing of the individual components (i.e. binder or aggregate). The most commonly used method for evaluating the moisture sensitivity of HMAC is the use of the moisture conditioning process as described by the AASHTO T-283 test method. Another major consideration when evaluating an antistrip additive is its ability to maintain good HMAC properties. In other words, the additive must not eliminate the moisture sensitivity problem on the expense of other desirable mixtures properties. For example, a successful antistrip additive would maintain the flexibility of the HMAC mixture at low and intermediate temperatures and its stability at high temperatures. The objective of this research project is to evaluate the effectiveness of the ULTRAPAVE® polymeric antistrip system (UP-5000) for use in HMAC mixtures. The effectiveness of the system is evaluated in terms of its impact on the moisture sensitivity and the temperature susceptibility of the HMAC mixtures. A laboratory mixtures evaluation experiment was conducted to compare the mixtures properties of the ULTRAPAVE® polymeric antistrip system with lime-treated and untreated mixtures. A single source of binder and two aggregates sources were used. A single type of asphalt binder was used throughout the experiment. It is an unmodified asphalt binder supplied by Husky oil with a Superpave performance grade of PG64-28 (2) The Rheological properties of the binder are summarized in Figure 1. According to the Superpave binder grading system, this binder will perform adequately in an environment where the pavement temperature ranges from a minimum of -28°C to a maximum of 64°C. Adequate performance means that the binder will exhibit good resistance to rutting, fatigue and low temperature cracking during the service life of the HMAC mixture. Two sources of aggregate were used: One source from Elko NV, and one source from Lockwood, NV. Elko is located in the northeastern part of Nevada and Lockwood is located in the northwestern part of the state near Reno, NV. The gradations of the aggregates were designed to meet Nevada DOT’s type II coarse gradation specifications. Tables 1 and 2 summarize the gradations of the individual stockpiles and the percentages used in the overall blends. It should be noted that the two aggregate sources have different nominal max sizes which are 19.0 mm and 12.5 mm for the Lockwood and Elko sources, respectively. Figures 2 and 3 show the gradation curves along with the Superpave control points and restricted zones. Both the Lockwood and Elko aggregate gradations satisfy the Superpave control points criteria. The gradation of the Lockwood aggregate violates the Superpave restricted zone criteria while the Elko aggregate gradation satisfies. The great majority of NDOT’s type II coarse gradations violate the Superpave restricted zone criteria. Table 3 summarizes the aggregate properties for the two sources. The Superpave criteria at less than 3 million ESALs and less than 100 mm depth were selected for comparison. The data in Table 3 indicate that both aggregate sources can be classified as normal weight and they both satisfy all Superpave criteria. In addition, the absorption capacity of both aggregates is well below the maximum 4% required by Nevada DOT. Two types of antistripping additives were used: ULTRAPAVE® UP5000 and hydrated lime. The UP-5000 was used at 0.75, 1.0 and 1.5 lb./ton of dry aggregate. The hydrated lime was used at 1.5% by dry weight of aggregate. The UP-5000 was received in a liquid form at 45% solids. Prior to mixing the UP-5000 with the dry aggregate, it was diluted to a 5% solids solution by mixing one part of the 45% solid solution with eight parts water. The solution was prepared using an analytical balance with 1/10000 gram accuracy. Prior to adding the UP-5000, the aggregates were wetted with 5% moisture and mixed to achieve saturation. The UP-5000 solution (5% solids) was then added to the saturated aggregates and mechanically mixed until a consistent surface appearance is achieved. The 0.75, 1.0, and 1.5 lb./ton of dry aggregate levels were achieved by adding 9, 12, and 18 grams of the 5% solids solution to a 1200 grams aggregate sample. After mixing, the samples were dried overnight in an oven at 230°F. The hydrated lime was added to the aggregate following the Nevada DOT’s procedure. The aggregates were first mixed with 5% moisture to achieve excess of saturated surface dry (SSD) condition and then mixed with 1.5% lime by dry weight of aggregates. The aggregates and lime were mechanically mixed for three minutes and then cured overnight in an oven at 230°F. The goal of this research was to evaluate the effectiveness of the ULTRAPAVE® polymeric antistrip system (UP-5000) in reducing the moisture sensitivity of HMAC mixtures. The performance of the ULTRAPAVE® system was compared to the performance of hydrated lime. Therefore, HMAC mixtures were treated with both the UP-5000 and hydrated lime and their properties were evaluated. The Hveem mix design procedure was used to identify the optimum binder contents. The evaluated properties included the resilient modulus (Mr) and tensile strength (TS) at 77°F at both the dry and moisture conditioned stages and the dry Mr at the 34, 77, and 104°F temperatures. The dry and wet Mr and TS were used to evaluate the moisture sensitivity of the HMAC mixtures while the Mr values at the three temperatures were used to evaluate the temperature susceptibility of the HMAC mixtures. Table 4 summarizes the testing program. 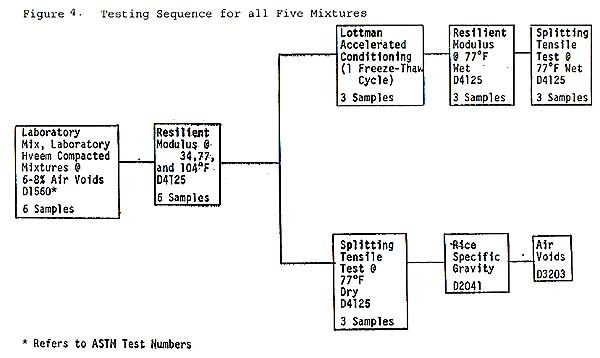 Figure 4 shows the testing sequence for evaluating the moisture sensitivity and temperature susceptibility of the HMAC mixtures. Lockwood source with 1.5% hydrated lime by dry weight of aggregate. Lockwood source with UP-5000 at 1.0 lb./ton of dry aggregate. Elko source with 1.5% hydrated lime by dry weight of aggregate. Elko source with UP-5000 at 1.0 lb./ton of dry aggregate. Using the above criteria, the optimum asphalt contents were selected and are summarized in Table 5. Table 5 also presents additional volumetric properties along with the corresponding Superpave criteria. The mix design data show that the UP-5000 reduces the optimum asphalt content while maintaining comparable mixtures properties. This reduction in the optimum content is more significant for the Lockwood source than for the Elko source. The data in Table 5 also show that all mixtures meet the Superpave volumetric criteria. The optimum asphalt contents summarized in Table 5 were used in the fabrication of laboratory samples for the evaluation of temperature susceptibility and moisture sensitivity of the mixtures. The moisture sensitivity of all mixtures was evaluated at their optimum asphalt contents with air voids content between 6 and 8 percent using the AASHTO T-283 test method. In summary, the test evaluates the tensile strength and resilient modulus of the mixture at 77°F before and after moisture conditioning. The moisture conditioning process consists of saturating the compacted mixtures between 55 and 80 percent followed by one cycle of freezing and thawing. Table 10 summarizes the retained strength ratios for all mixtures. Typical specifications for HMAC mixtures require a minimum of 60 – 70% retained strength ratio. Some specifications also require minimum value for the unconditioned tensile strength. Nevada’s HMAC specifications require a minimum unconditioned tensile strength of 65 psi and a retained strength ratio of 70%. Very limited data are available on the resilient modulus properties of moisture conditioned HMAC mixtures. The data in Tables 6 through 10 indicate that the Lockwood aggregate can be classified as a marginal source while the Elko aggregate can be classified as having a severe moisture sensitivity. This provided an opportunity for evaluating the UP-5000 system under two different conditions. 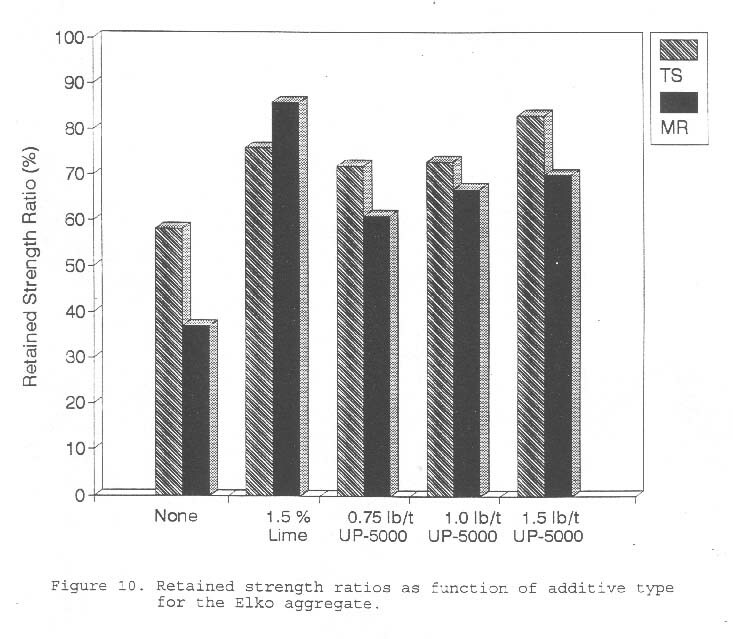 Figures 5 through 10 compare the influence of the various types of modifications on the absolute strength values and the retained strength ratios. The data in Figures 5 and 7 show that the UP-5000 increases the dry tensile strength while maintaining a wet strength value that is higher or equal to the lime treated and untreated mixtures. 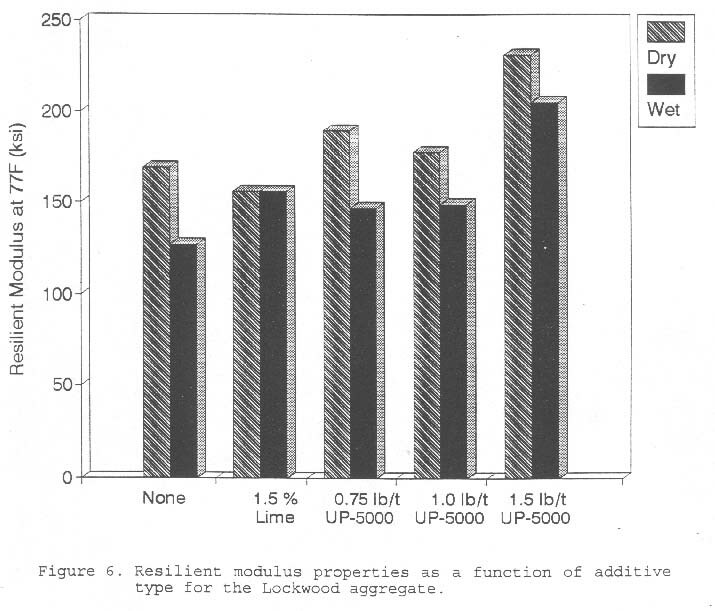 In the case of the resilient modulus properties ( Figures 6 and 8), the UP-5000 mixtures showed an improvement for the Lockwood aggregate in both the dry and wet Mr (1. 5 lb./t) while for the Elko aggregate the wet Mr dropped below the lime treated mixtures. It should be noted that the tensile strength is more commonly measured than the resilient modulus property. By looking at the absolute values of the TS and Mr, it can be concluded that the UP-5000 is as effective as lime in increasing the strength parameters of the HMAC mixtures at both the dry and wet stages. 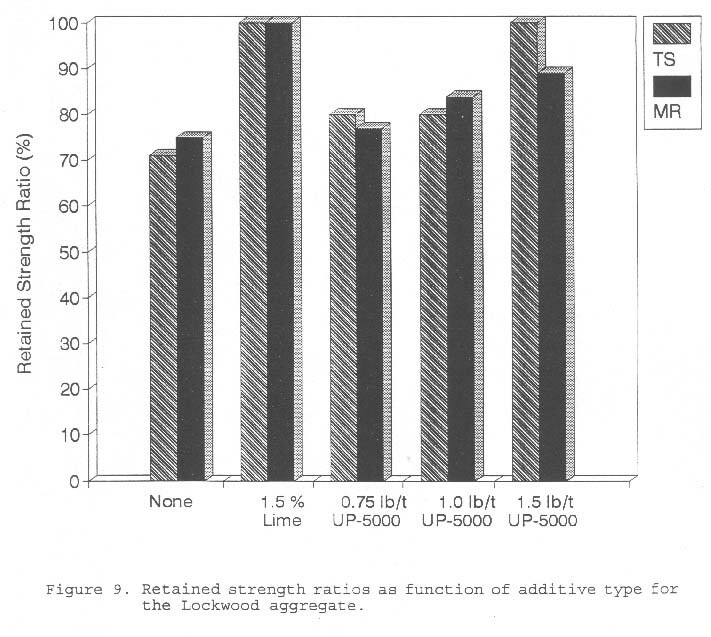 When considering the reduction in the optimum asphalt content associated with the UP-5000 (0.85% for Lockwood-and 0.40% for Elko), such an additive becomes very attractive. When the UP-5000 is used with a marginal aggregate source (i.e. Lockwood) it works on significantly reducing the asphalt demand while maintaining the strength properties at levels comparable with the lime treatment. When the UP-5000 is used with a severe stripper (i.e. 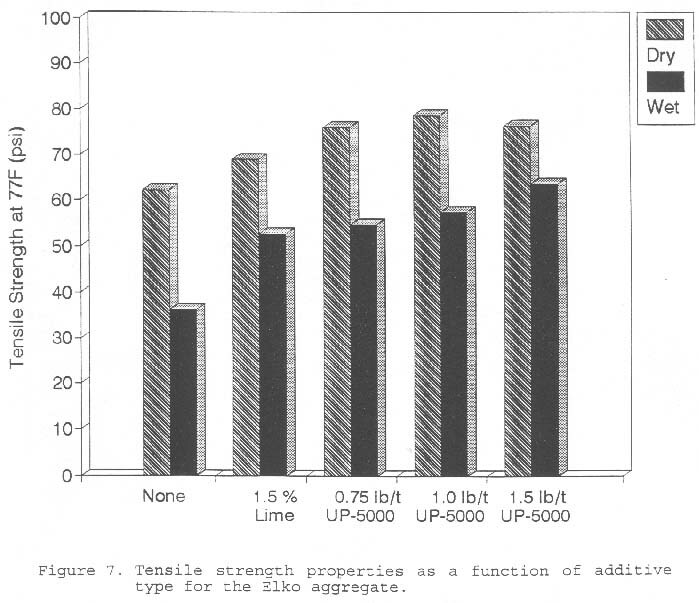 Elko) it works on marginally reducing the asphalt demand while maintaining the strength properties at levels comparable with the lime treatment. This indicates that the UP-5000 would provide benefits under most conditions. 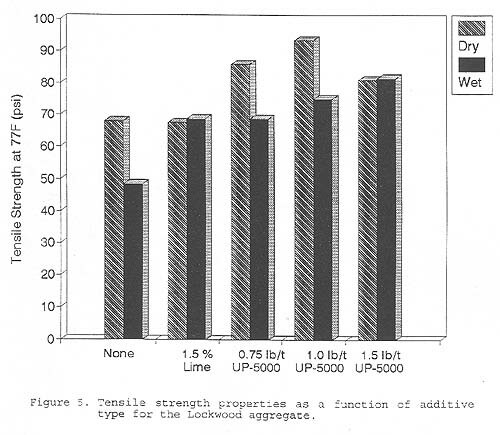 By looking at the retained strength ratios as shown in Figures 9 and 10, it can be concluded that all three concentration levels of the UP-5000 would satisfy the retained tensile strength ratios of 70% for both aggregate sources. In the case of the retained Mr ratio, The Lockwood aggregate would satisfy the 70% at all concentration levels while the Elko aggregate requires the 1. 5 lb./t to satisfy the 70% minimum retained ratio. The data generated in this research provides a clear example as to why moisture sensitivity criteria should include both a minimum absolute value and a minimum retained strength ratio. The data in Tables 6, 8 and 10 will be used to conduct a quick analysis on how misleading a minimum ratio criterion can be. Data sets similar to the ones listed above are used by pavement/materials engineers on a daily basis to select the best mixture for a given job. Considering all the data including the dry TS, wet TS and ratio, the most desirable mixtures would the UP5000 at 1.0 lb./t for the Lockwood aggregate and the UP-5000 at 1.5 lb./t for the Elko aggregate. Even though other mixtures showed 100% retained ratios, the above selected mixtures would provide a mixture with a better overall long term performance. Temperature susceptibility of HMAC mixtures is defined as the variation of the mixtures Mr as a function of temperature. It is an important characteristic of the HMAC since it controls how the mixture will behave under various environmental conditions. A mixture that is stiff at low temperatures would cause low temperature cracking problem while a mixture that is soft at high temperatures would cause rutting problems. Fatigue cracking is normally associated with a mixture exhibiting stiff behavior at intermediate service temperatures. The temperature susceptibilities of the HMAC mixtures were evaluated using the resilient modulus property at three temperatures, namely 34, 77, and 104°F. Figures 11 and 12 show the temperature susceptibility for the Lockwood and Elko mixtures, respectively. The data showed that there is not any significant difference among all mixtures. None of the mixtures stood-out to have significantly better or worse temperature susceptibility than the rest. The UP-5000 mixtures show slightly higher M, values at 104°F than the untreated and lime treated mixtures for the Elko aggregate which indicates potentially more stable mixtures from this source. A total of ten HMAC mixtures were evaluated in this laboratory-based research program. The experiment covered three different antistrip additives, two sources of aggregates and one type of asphalt binder. The performance of the HMAC mixtures was measured in terms of their moisture sensitivity and temperature susceptibility. The objective of the study was to evaluate the effectiveness of the ULTRAPAVE® polymeric antistrip system in eliminating the moisture sensitivity of HMAC mixtures. Hydrated lime was selected as one antistrip additive due to its popular use in the western states. The two sources of aggregates represented a marginal and a severe stripper which provided the opportunity to evaluate the UP5000 additive under two different conditions. The binder and aggregates used in the experiment were evaluated using the Superpave system while the Hveem mix design procedure was used to select the optimum binder contents. Based on the analysis of the data generated in this experiment, the following conclusions can be made. The binder used in this research was graded as PG64-28 which is a very common grade throughout the U.S. The measured properties of the aggregate sources met all the Superpave specifications on fine and coarse aggregate angularity, sand equivalent, and flat and elongated particles for less than 3 million ESALS. The moisture absorption of both sources was well below the 4% maximum required by most state highway agencies. In addition there was not any significant differences among the measured aggregate properties of the two sources. The optimum asphalt binder content significantly differs among various mixtures. The UP-5000 showed a significant decrease in the asphalt binder demand as compared to the untreated and lime treated mixtures (0.40-0.85% reduction). The reduction in the optimum asphalt content also differs between the aggregate sources. The Elko source aggregate showed a decrease of 0.40% while the Lockwood aggregate showed a decrease of 0.85%. The physical properties of the aggregates did not identify any reason for this difference. The only property that could contribute to this behavior is the difference between the gradation curves of the two sources. 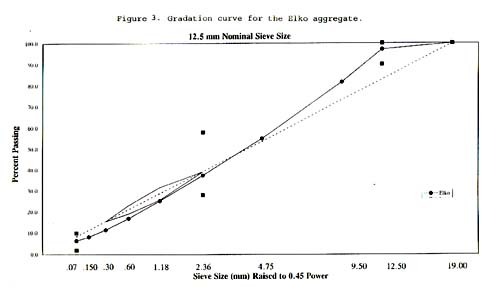 The Elko source has a smaller maximum size and a higher percentage of passing the #200 sieve. This would indicate a higher surface area which makes the UP-5000 less effective in reducing the asphalt binder demand as the Hveem mix design indicated. The UP-5000 showed a noticeable increase in the absolute values of the dry and wet tensile strength for both aggregate sources at all levels of concentration as compared to untreated mixtures. The retained tensile strength ratios also showed that the UP-5000 at any one of the evaluated levels can be as effective as the 1.5% lime. 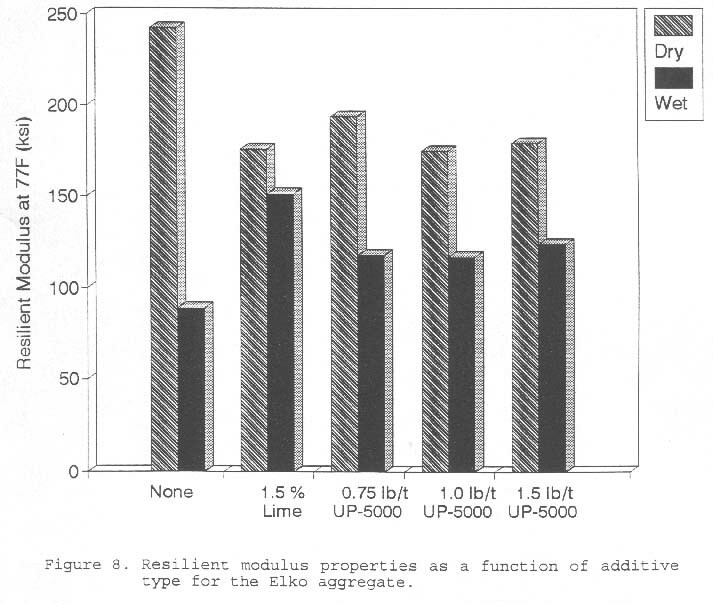 In the case of resilient modulus retained ratio, the Lockwood aggregate would satisfy the minimum 70% ratio at all three levels while the Elko aggregate would require the 1.5 lb./t concentration to satisfy the 70% criterion. In summary, the UP-5000 showed that it is very effective in eliminating the moisture sensitivity of a severe stripping aggregate source such as the Elko source while significantly improving the performance of a marginal source like the Lockwood aggregate. The data generated from this research showed that when both absolute values of the strength and retained strength-ratios are analyzed, the UP-5000 additive would produce HMAC mixtures that have good resistance to moisture damage. The measured temperature susceptibilities of all mixtures were very similar. None of the mixtures stood-out as having a significantly better or worse than the rest. In addition, all evaluated mixtures have acceptable temperature susceptibility. This indicates that the UP-5000 can be used to improve the resistance of HMAC mixtures to moisture damage without the danger of negatively impacting their long-term performance. However, the resistance of the conditioned mixtures should be directly measured using the Superpave mixtures evaluation methods. AASHTO Materials, Part II, Tests, Washington, D.C., 1995. Asphalt Institute, “Superpave Asphalt Binder Specification,” Superpave Series No. 1 (SP-1), Lexington, Kentucky, 1994.